Durable, flexible, and shock-absorbing, Freesole® Urethane Formula Shoe Repair is made from the same material as most shoe soles, so it can quickly reattach soles, rebuild worn heel and toe areas, and create tough toe caps. 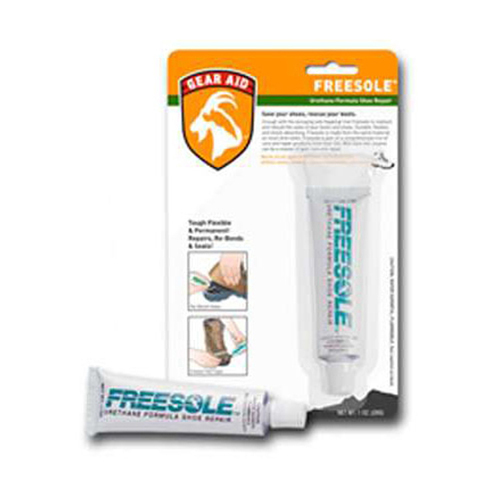 Use Freesole to reattach and rebuild the soles of your boots and shoes. Freesole is part of a comprehensive line of Care and Repair products from Gear Aid. With Gear Aid, anyone can be a master of gear repair. Works on all types of footwear, including boots, athletic shoes, climbing shoes, rollerblades, and more.